Completed 2019 Symposium Brochure forthcoming. 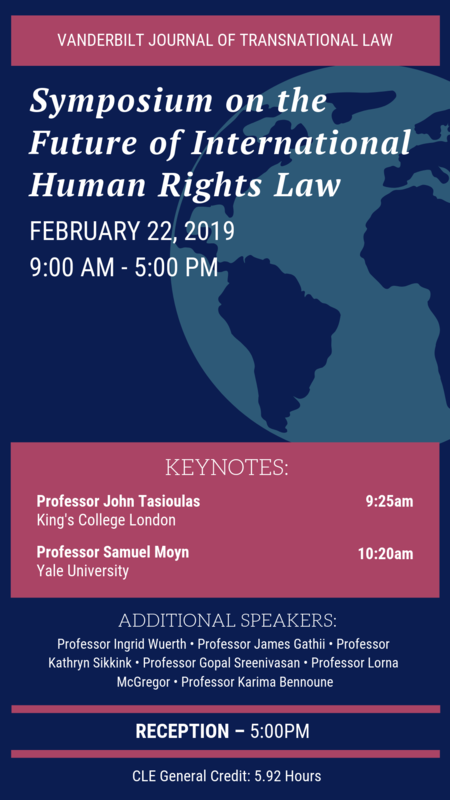 The Vanderbilt Journal of Transnational Law is pleased to announce that our upcoming 2019 Symposium on “The Future of International Human Rights Law,” will take place on Friday, February 22, 2019. Our 2019 Symposium will include two individual Keynote addresses, by Professor John Tasioulas (King’s College, London) and Professor Samuel Moyn (Yale University). Comments on the Keynotes will be provided by Professor James Gathii (Loyola University, Chicago), Professor Kathryn Sikkink (Harvard University), Professor Gopal Sreenivasan (Duke University), Professor Lorna McGregor (University of Essex), and Professor Karima Bennoune (University of California, Davis). Professor Ingrid Wuerth (Vanderbilt University), will moderate the Symposium and provide closing remarks. Brief biographies of the speakers bay be found here. For a full schedule of the February 22, 2019 Symposium, please see here. Further information regarding the 2019 Symposium will be posted here in the near future. For more up-to-date information regarding the Journal, please feel free to follow us on Twitter @VandyJTL.